Oh, these Toppling Goliath IPA's have become things of legend over the past few years. A few months ago I reviewed the all-Citra King Sue, which caused me to blow the proverbial load. 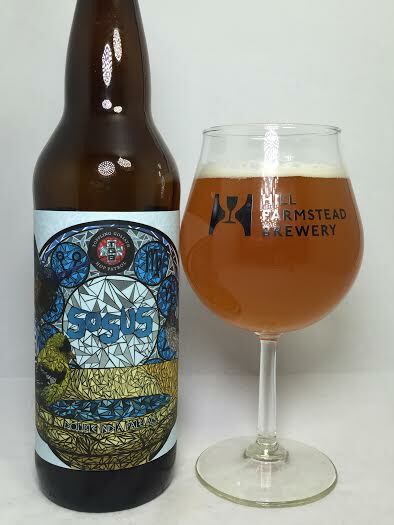 Sosus is similar in that it instead of being all Citra hops, this is an all Mosaic-hopped Double IPA. Pours a hazy, dark, rusty orange with a finger of frothy white head. Some sediment is sitting at the bottom of my glass too. All I get on the aroma is cedar and black pepper with some grass and a touch of peach. Hmmmm. I don't know exactly what to say about the taste here. I've had beers that use Mosaic hops beautifully (See: Trillium DDH Melcher Street) and those were hop juice explosions with massive tropical fruits. The flavors I am picking up are wet leaves, dirty grass, green tea, and mint. The green tea/mint flavors aren't new to me as other beers I've had have utilized hops with those characteristics, but those weren't Mosaic hops. There's a noticeable dank quality with maybe some hop resin,, but not a hop juice taste per se. A small amount of that pepper from the aroma is here as is some sap and tree bark. Mouthfeel is nice and full without being syrupy or thick for a big 8.0% DIPA. No alcohol or warming whatsoever. Sosus had some dank qualities, but overall it was an odd assortment of flavors that didn't compare to other Mosaic-hopped beers. No tropical fruits or juices were present and all I got were some off flavors of wood and spices. The flavors here didn't mesh together well and I think just the faintest presence of peach and apricot made this an okay experience. As of this drinking, it is November 24th and I was told this was bottled November 11th, so this is (allegedly) less than two weeks old. If what I was told is true, then I can't blame a bad bottle for the disappointment. Toppling Goliath has produced better hoppy beers and I'd suggest seeking those out instead.